Etching, Anonymous, 29 x 21.4 S.
COLLECTION: Paris, Bibliothèque Sainte-Geneviève, Est.15 Rés., f. 87; the image probably slightly cropped all around; several tears and parts missing at the upper left edge and at lower left, the composition made up in ink. Viel, Jean, Les estampes du XVIe siècle d’un fonds de la Bibliothèque Sainte-Geneviève (Armoire 8), Diplôme Supérieur de Bibliothécaire, École Nationale Supérieur des Bibliothèques, 1983 (typescript), no. 111, as after Rosso, and related to his fresco in the Gallery of Francis I. Viel believed it was by the same etcher who did Bartsch, XVI, 1818, 409-410, 84. 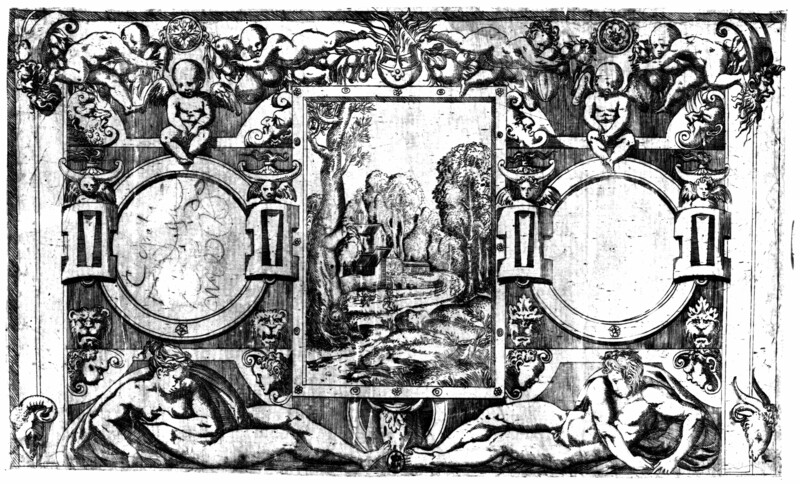 Zerner, 1988, as done in the mid-1540s, as related to Rosso’s fresco, and as after a lost drawing by Rosso not for this fresco but perhaps conceived as a pendant to his Mars and Venus drawing. Béguin, 1989, 837, noted an important iconographic difference in the relation of the putti to the book, and thought the architecture unlike Rosso’s and the right side of the composition awkward. Boorsch, in French Renaissance, 1994, 231, n. 5, as perhaps by Master I.♀.V. 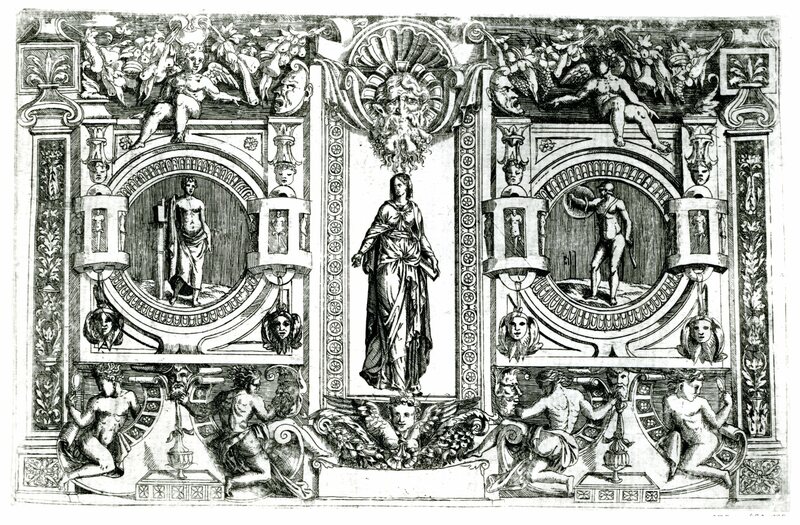 As Viel and Zerner recognized, this etching shows basically the same composition as Rosso’s large Venus and Minerva fresco in the Gallery of Francis I (Fig.P.22, I N a), but in reverse. Thematically, the two scenes are more or less the same (for their small differences, see P.22). What is significantly different is the format of the scenes, with the etching decidedly vertical and the fresco equally decidedly horizontal. 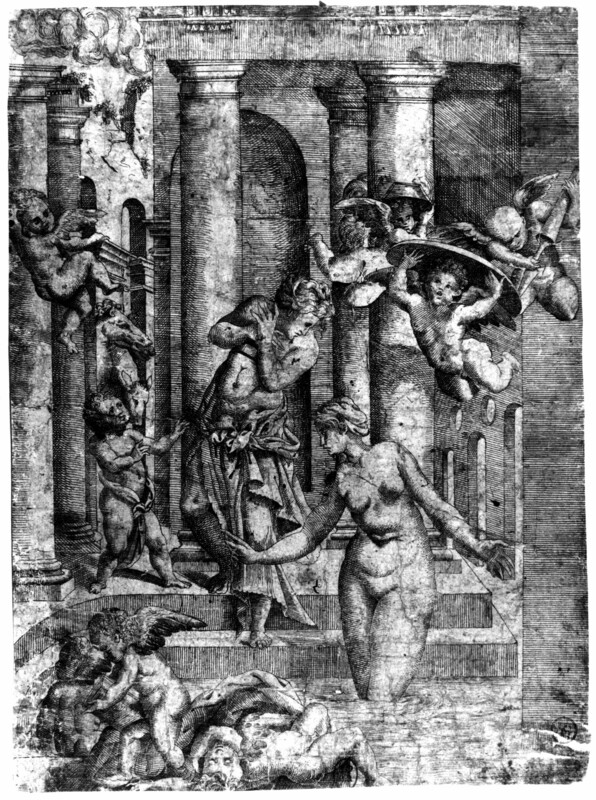 Zerner believed the etching was after a lost drawing by Rosso, and this is almost certainly the case, as is true of all the sixteenth century prints made of Rosso’s compositions. 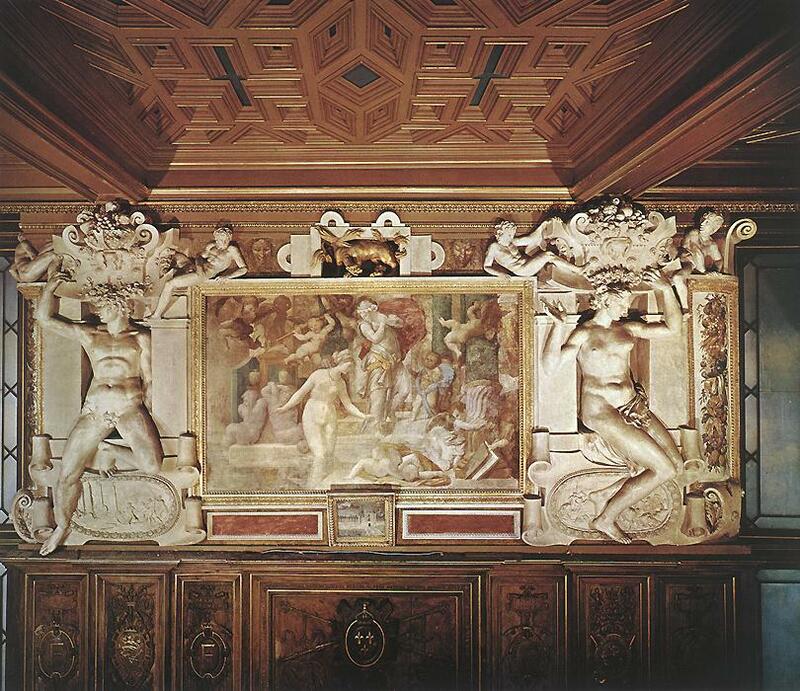 Zerner suggested that the lost drawing was probably not made for the gallery but as a pendant to Rosso’s Mars and Venus drawing and that then its composition was re-designed to accommodate it to the format of the large frescoes in the gallery. There is, however, no evidence that Rosso anywhere else utilized in the gallery a composition that he had originally invented for some other occasion, and I doubt that this etching is the unique surviving piece of data that indicates that he did. In this Phase I of 1531/1532 to 1534, the general design of the whole decorative scheme of the gallery was being considered, preceding the beginning of the execution of the stuccoes. 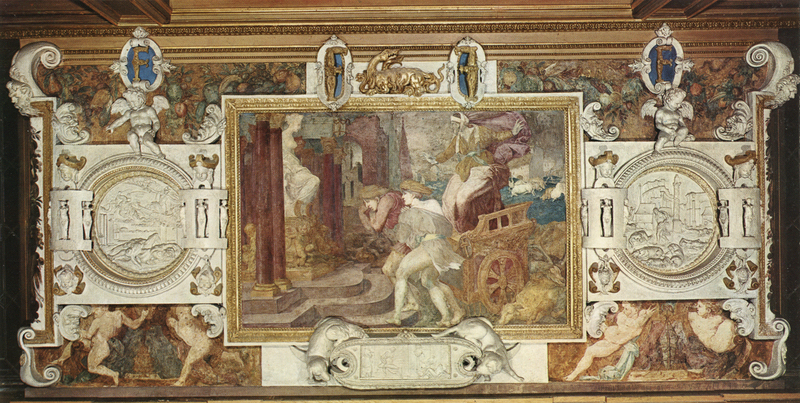 This included for a moment, it would seem from the evidence of the oval format of the copy of Rosso’s drawing for the Education of Achilles (Fig.D.53), that at least some of the large frescoes, in addition to the Nymph of Fontainebleau (Fig.E.103) and its replacement, Primaticcio’s Danaë, would be horizontal ovals. 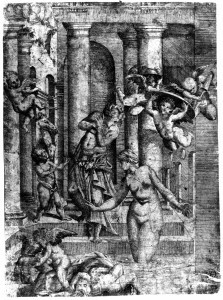 There is an etching of a cartouche by Fantuzzi (Fig.E.87), related to the Cleobis and Biton wall in the Gallery of Francis I (Fig.P.22, V S a), that shows a vertical rectangle as the area for the central fresco (filled in the print by a landscape). 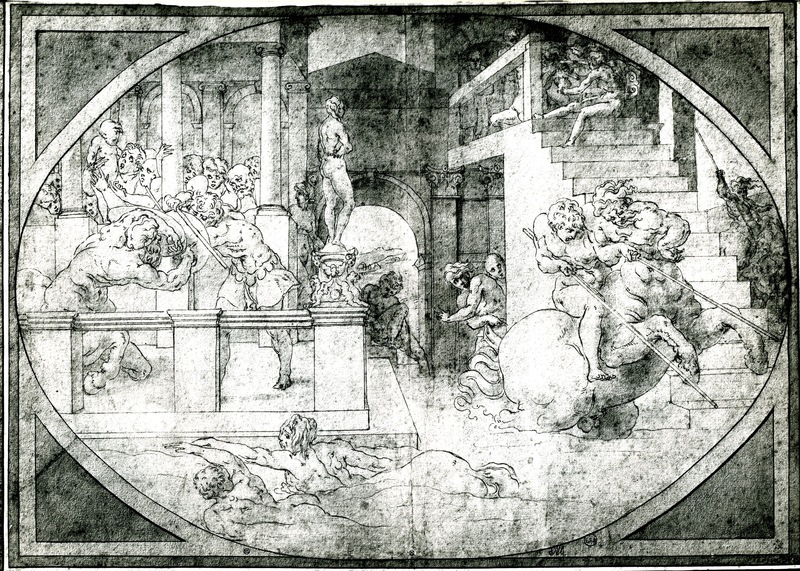 It could be assumed, as I once did, that parts of the print are dependent upon a lost drawing by Rosso for the Cleobis and Biton wall and perhaps on other drawings by Rosso as well, but that their combination in the etching and the use of the central vertical rectangle were the work of Fantuzzi. This was also suggested by the fact that the wall area indicated in the etching seems too narrow in relation to the actual wall areas in the gallery. But this is only true if it is assumed that the wall area shown in the print is meant to be the same height as in the gallery. It is quite possible that at some early moment the decorated area of the walls in the gallery was to be higher and the wainscoting below shorter than finally was decided. Furthermore, some, at least, of the large frescoes may have been considered as upright rectangles. 1 Viel thought that the shape of the eyes in the print and the technique of the etching resemble those of an anonymous Fontainebleau print described by Bartsch (see above) as showing The Betrothal of a Greek and a Young Woman (Zerner, IB, 33, 1979, 359). 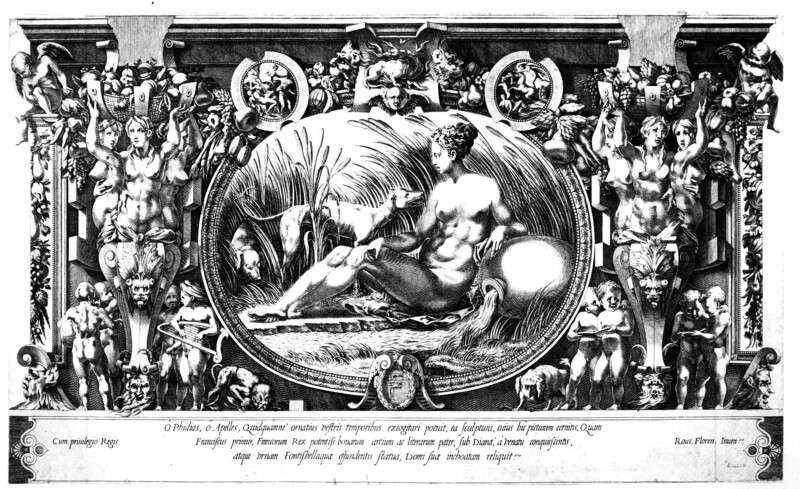 But that print appears so much more accomplished than the anonymous Venus and Minerva that it is difficult to see that both could be by the same etcher, unless the latter print dates from a significantly different moment of his activity. 2 See also Fig.E.145, related to the Cleobis and Biton wall, but where the anonymous etcher seems to have worked from a drawing for only the left side panel of this wall in the gallery, doubling it, reversing it, and creating a very narrow vertical area in the center of the print in which he placed a standing draped woman. This could reflect an original scheme in the gallery with a vertical fresco in the center of the wall.